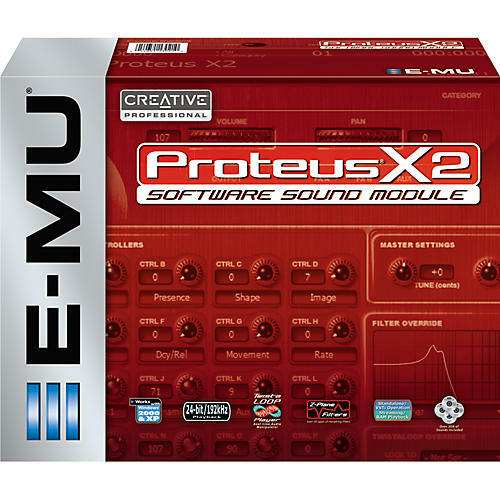 Proteus® X2 is a 24-bit/192kHz software sound module for your PC that combines the sound quality, advanced synthesis and Z-Plane filters of legendary sound modules like the Morpheus and Mo'Phatt with E-MU's latest groundbreaking tools like TwistaLoop™, Morph Filter Designer and Multi-Function Generator. Proteus X2 is the culmination of over 15 years of sound module development, and offers an arsenal of unparalleled tools to effortlessly dial in the right sound in seconds. TwistaLoop™ Player is a real-time audio manipulation tool for samples with beat, bar, and loop information that offers real-time audio time expansion/compression, the ability to play different beats or bars from the same sample, the switching in real-time of which loop plays via a continuous controller, and much more. TwistaLoop allows you to sync these loops to Proteus X2's master tempo or to external tempo sources (like a VST host).